At first frowned upon by Hollywood agents, many actors are now actively seeking voice over roles in videogames. It used to be a really big deal when some actor or celebrity you actually knew appeared in a videogame. The first moment genuine personal excitement to see a "real" actor's performance in a game was Mark Hamill in 1994's Wing Commander III. Back then, many old school Hollywood agents frowned upon the backlash that an actor might receive for appearing in such "genre trash" but that didn't stop people like Patrick Stewart (too many to mention), Liam Neeson (Fallout 3) or Samuel Jackson (GTA: San Andreas) from making notable games. In what seems to be the final shift in the culture, Hollywood agents have now realized that videogames might offer them more cachet than disgrace and have begun knocking on game developers doors instead of the other way around. At least, that's what Bethesda's Todd Howard said he's experienced while making Skyrim. "Videogaming overall have reached this level of mass consciousness," Howard said. "There is a cool factor now to doing a videogame. It's not about the money. It's about, 'It's really cool and my agent tells me it's going to be good for me now instead of bad for me.'" 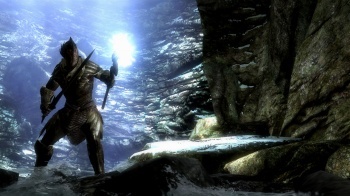 Howard wouldn't go into more detail regarding any familiar voices in Skyrim other than the already announced Max Von Sydow playing the game's narrator. "He is not the only one," Howard said when asked about recognizable voices in the cast. "We're fortunate in the games we make and how they're thought of in the industry that actors want to do them a little bit more, honestly." Well, if an actor has played Fallout 3 or Oblivion, of course he or she would want to appear in anything Bethesda did. I'm sure half of Hollywood is waiting for 11.11.11 for Skyrim just like the rest of us.